Jozy Altidore scored from the penalty spot and Toronto FC won 1-0 at the Seattle Sounders on Saturday in a rematch of last year's MLS Cup final. The United States striker drew the penalty himself when he was bundled into from behind byRoman Torres and made no mistake from the spot for his sixth goal of the season. Altidore was the main threat in the first half as he also put a cross-goal shot just inches wide of the post, then was denied by a fine save by Stefan Frei in a play reminiscent of theSeattle keeper's famous stop in December that preserved the Sounders' title. The Sounders' defeat was their first at home since Brian Schmetzer took over for longtime coach Sigi Schmid last July. 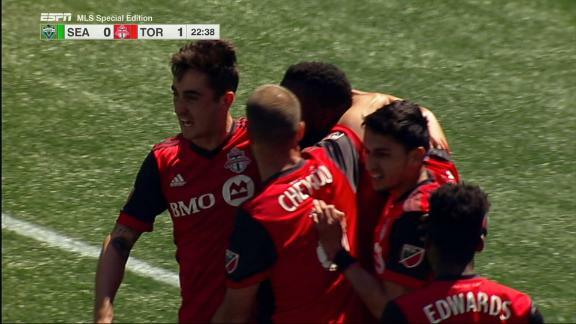 Toronto moved above Orlando City into first place in the Eastern Conference. CJ Sapong scored three times in an 11-minute span late in the second half to help the Philadelphia Union win for the first time since August, 3-0 over the New York Red Bulls. The floodgates opened for Philadelphia in the 74th minute after New York's Aaron Long misplayed a header on a long ball. Sapong gathered the loose ball and drove inside the box before his shot deflected off Long's ankle over goalkeeper Luis Robles. Just moments after a big save by Union goalkeeper Andre Blake, Sapong picked up his sixth goal in the 81st minute, tapping in a header after Chris Pontius got his head on a long cross from Fabian Herbers. And four minutes later, Sapong completed his first hat trick from the penalty spot after Damien Perrinelle handled a cross inside the box. Mauro Manotas had two goals and an assist in the second half and the Houston Dynamo beat Orlando City 4-0. Houston led 1-0 at halftime with Alberth Ellis' fourth goal of the season, before Manotas took a cross from Alex in the 51st minute and blasted a shot through goalkeeper Joe Bendik's arms. He picked up his third goal of the season in the 65th minute, capping a 2-on-1 counter attack with Romell Quioto with a shot that went in off the post. Ten minutes later, Manotas had a long serve forward to Quioto, who curled a high shot from the top of the box into the corner for his fourth goal this year. Orlando City ended last weekened with an MLS-best 18 points but suffered its second-straight loss since, having dropped a 2-1 match in Toronto on Wednesday. Teenager Ballou Tabla scored the only goal as the Montreal Impact secured a 1-0 win over D.C. United at RFK Stadium. Tabla, 18, scored the second goal of his MLS career in the 13th minute when he shrugged off a tackle from D.C.'s Jared Jeffrey, then dribbled in space before unleashing a low shot from just outside the box that trickled past goalkeeperTravis Worra. Luciano Acosta hit the crossbar in the second half for D.C. United, while Kofi Opare had a goal ruled out for offside, but the hosts could not find an equalizer. It was only the second win of the season for Montreal, which is 10th in the Eastern Conference.The Impact had allowed nine goals in their five road losses and had not posted a clean sheet all season. 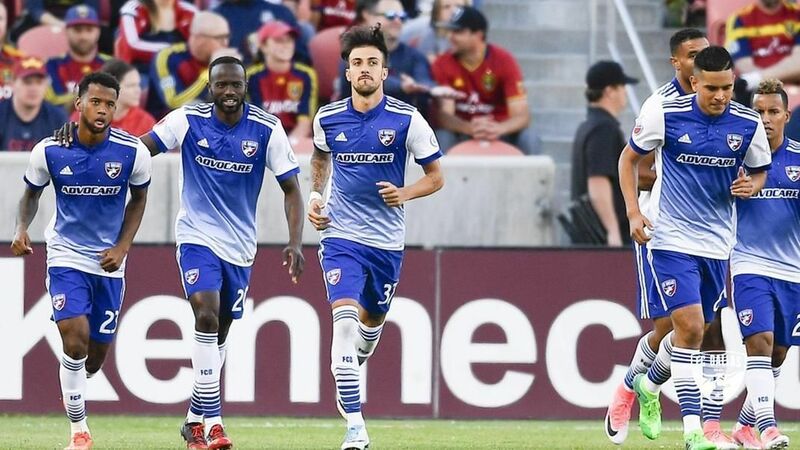 Max Urruti scored twice to help unbeatenFC Dallas to a 3-0 victory over Real Salt Lake and move level with Sporting Kansas City atop the Western Conference. Urruti converted from the penalty spot in the third minute after Demar Phillips was called for a handball near the endline. Matt Hedges made it 2-0 in the 67th minute, shielding defender Justin Schmidt and then heading home a perfectly placed corner kick by Kellyn Acosta, and Urruti added another goal -- his seventh of the season -- in the first minute of stoppage time. Ola Kamara had a goal and an assist to lead Columbus Crew SC to a 2-0 victory over the New England Revolution. Kamara opened the scoring with his sixth goal of the season in the 13th minute. He dribbled down the left side, stepped right and curled the ball just inside the far post. Kamara's patience then led to Federico Higuain's third goal in the 53rd minute. Higuain sent the ball forward to Kamara on his right and continued forward. Kamara pushed the ball ahead and stopped, waiting for support before sending the ball back to the streaking Higuain, who buried the shot high from just outside the box. The Revolution are winless in seven straight away games, and only once have they scored more than once in that string, getting three in a draw at Seattle last weekend. Chris Wondolowski scored two goals, reaching 125 for his career, and San Jose smashed Portland 3-0. David Bingham made four saves in blanking the Timbers, who had a league-leading 20 goals coming into the game. It was Bingham's fourth shutout, giving him 24 in his career. Florian Jungwirth assisted on both of Wondolowski's goals. The first came in the 31st minute when Jungwirth put the ball on Wondolowski's foot at the top of the box and he turned around and bent the ball around goalkeeper Jeff Attinella for his third goal of the season. 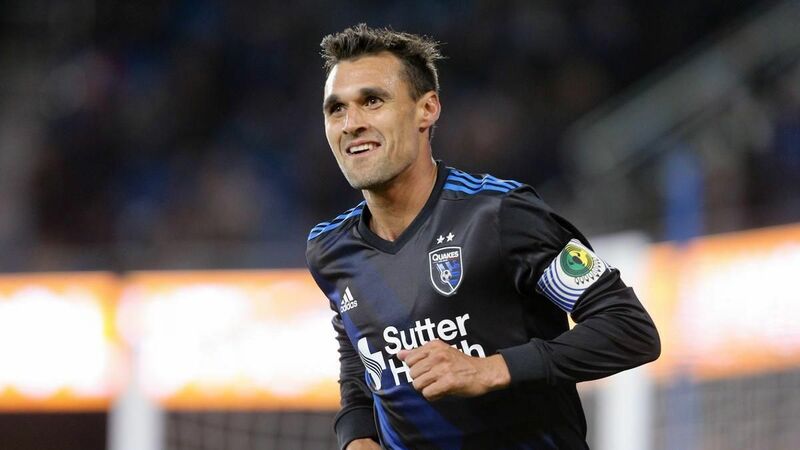 Wondolowski took a feed from Jungwirth in the 55th minute and beat Attinella from a sharp angle for his 10th career goal against the Timbers. Giovani dos Santos and Daniel Steres scored second-half goals as the LA Galaxy rallied to draw 2-2 with the Chicago Fire. Brian Rowe had four saves, including a pair of sprawling stops in the opening minutes and another in the 76th minute, for LA. Dos Santos tied it in the 65th -- tapping in the finish of Dave Romney's header, off a corner kick by Romain Alessandrini from point-blank range. David Accam gave Chicago a 1-0 lead in the 13th minute, converting from the spot after Nemanja Nikolic drew a penalty against Jelle Van Damme at the top of the six-yard box. Nikolic doubled the lead moments later, rolling a feed from Accam past a charging Rowe into the back of the net. Steres, from near the right corner of the six-yard box, flicked a header -- off another corner kick by Alessandrini -- inside the far post to make it 2-1 early in the second half. Greg Vanney's gamble to rest Sebastian Giovinco and other starters didn't backfire, as Toronto earned a win at Seattle. C.J. Sapong's late hat trick against New York Red Bulls propelled Philadelphia Union to their first win of the 2017 season. Orlando City dropped their second match of the week as a dominant Houston side put four stellar goals past Joe Bendik. Montreal took one of their few chances on the road to steal three crucial points from their Easter Conference rivals D.C.
Max Urruti bagged a brace as FC Dallas continued their unbeaten start with a comfortable win over Real Salt Lake in Utah. The Crew scored a pair of delightful goals, while New England couldn't seem to bury one of their many chances on the night. Chris Wondolowski scored twice courtesy of Florian Jungwirth passes to lead San Jose to victory over Portland Timbers. Gio Dos Santos scored the equalizer as LA Galaxy overcame an early 2-0 deficit to earn a point against Chicago.